Last month I published hydrophone recording „Crawling glacier“ from the lagoon beneath Svínafellsjökul icefall. The original recording contains two other channels with the sound above the lagoon. It is not as clear in this short mp3 file as it is with headphones in the field, but during the recording it seems to be possible to hear the flow of the icefall though the valley. Its is a slow event. It usually starts high above in the mountain with rumbling sound and then slowly moves in a shock wave as a silk smooth „white noise“ though the valley all the way to the toe of the icefall. Regularly the ice moves faster in some places when the pressure get high. Then it cracks, some parts brake off and other just crawl faster which is usually audible for everyone. This behavior of the glaciers is not often audible during the day because of traffic, wind or the clear sun which can easily disturb the sound waves in the air. Then it is also too slow for impatient listeners. Nights are usually the best time to hear this sound of the „flowing mass“. Changeable nature or different types of glaciers will also play a big rule how it acts and sounds. It is a special feeling to stay close to a glacier. It’s like standing near a wast monster that is constantly moving, but very slowly. Everywhere around this flexible ice the gravity of the ice is visible. Glaciers usually have strong smell of fresh oxygen that glaciers have captured in ice and compressed in to locked bubbles for hundreds and thousands of years. This smell from the past is like from another world, probably because today has much more carbon dioxide in the atmosphere than it has been for 800 thousand years at least. Glaciers also make sounds, sometimes quite loud, from falling drops of water to earthquakes, but most of these sounds are not audible to human ears. 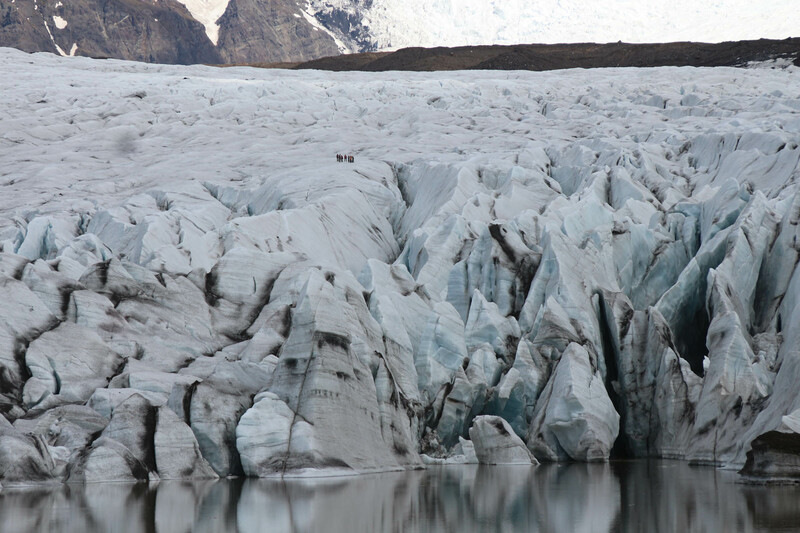 Glaciers make constant sound in water which needs hydrophones to capture, as can be heard on the following recording. I can not say I have been lucky in recording glacier sounds in years past. I’ve always been at the wrong place at the wrong time when glaciers produce “big sounds”, but after many hours, and several days on the same spot, I got something interesting which is worth listening to. One of those days was 5th of June 2015 when I was at the glacier lagoon neneath of Skaftafellsjökull glacier’s icefall. This lagoon is not big, probably around 500m squared, but the depth is around 80 meters so the soundscape beneath the surface can be pretty exhilarating when the glacier is crawling at the bottom of the lagoon. I put two hydrophones in the lagoon and two microphones on a nearby hill and recorded there for almost fourteen hours. 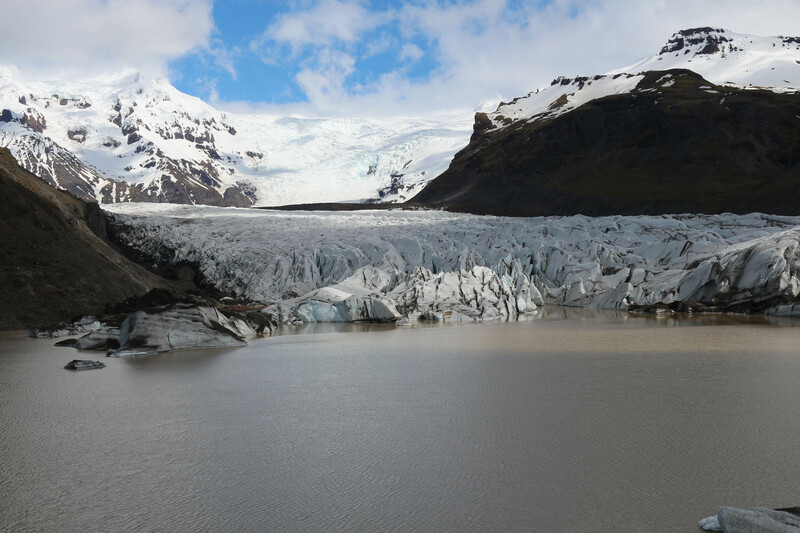 The gain on the recorder was almost equal on all channels, or around 48dB, and during these 14 hour session the soundscape was different mostly because the glacier surface melts differently during the day then during the night with different water flows into the lagoon. All the time the glacier was grinding the bottom of the lagoon so under the lagoon’s surface the soundscape was much nosier than above. Then just before midnight the glacier did a “big move” (starts 25:00) which lasted for several minutes, crawling with cracking and scratching sound. The soundscape down in the lagoon sounds really strange and surreal, but the listener must keep in mind that sound travels much faster in water than in the air. The soundscape above the lagoon was different. It was possible to ‘feel’ or ‘see’ through the audio the movement of the whole Svínafellsjökull glacier icefall through the valley. But that recording will be for another soundblog. Quality open headphones are recommended while listening at mid level, or in speakers at medium level. One year ago I was recording in Skaftafell national park and neighborhood in southeast of Iceland. One of my favorite recording place in this area is not exactly in the park, but on Skeiðarársandur, a huge broad sandy wasteland along Iceland’s south-eastern coast, between the Vatnajökull icecap and the sea. One of the reason I love this place is the silence. There is almost „nothing“. Just the sand. In the horizon far away is the glacier Vatnajökull on the one side, and on the other side just the sky. The only thing that disturbs this silence is traffic or the wind. So when it is calm during the night and traffic is down it is possible to listen deep into this amazing open space. There is not much life. There is probably only Rock Ptarmigan that lives there all year around. 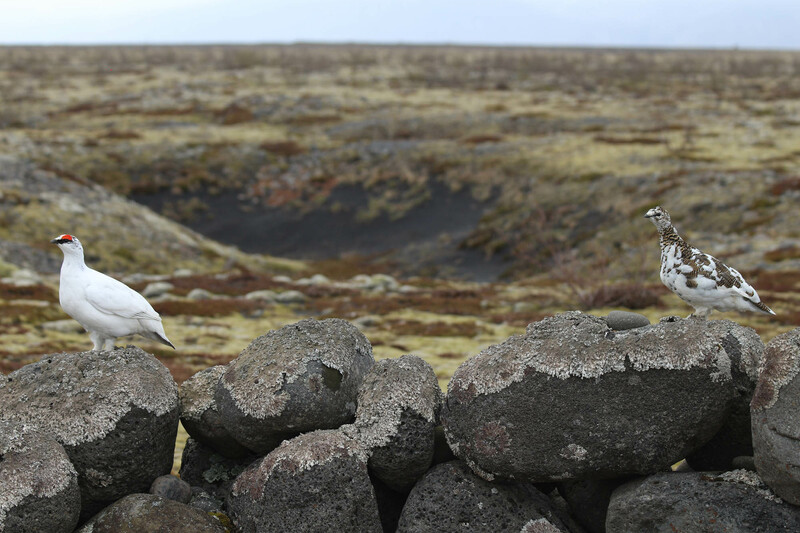 Other species are migrants during the summertime so it is easy to say, Rock Ptarmigan is the residents of silence. This recording is a recording of silence. Most people will not hear anything in this circumstances, probably only its own heartbeat and notice „they have“ tinnitus. But with best equipment is it possible to listen deeper into this quiet place. You will hear some birds and insects. With good headphones you will hear the rumble sound of heavy surf on the beach 20 to 30 km far away. BUT this recording is not completely quiet. So be careful while listening. Two birds, a male and female Rock Ptarmigan, are coming very close, „talking“ loud into your ears (2:05). It is also worth to listen to another earlier recording from this place. „Stories from Skeiðarársandur„. Bæjarstaðaskógur (Farmsted forest) is a small forest in the east of Iceland, in Morsárdalur, in Skaftafell national park. 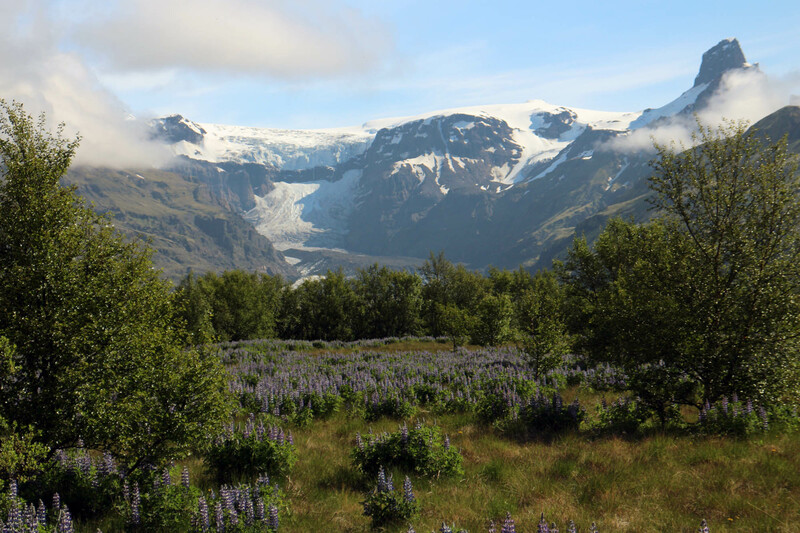 Morsárdalur, is a wide valley blanketed with woodland, contains multicolored rhyolite formations at Kjós valley, and the outlet glacier Morsárjökull with its creaking icefalls. The forest’s name, Bæjarstaðaskógur, suggests that it used to be a farmstead during the Middle Ages and the ruins were quite visible until the 18th century. Bæjarstaðaskógur is a beautiful oasis in the vast spread of sand. This 30 hectare forest is the most robust birch forest in Iceland, its birches can reaching 12 meters height. There are also Island’s straightest birches and the most precious. Bæjarstaðaskógur also has rowans and the most beautiful display of Icelandic wildflowers. I have noticed that Redwing songs in this area is very different from other normal Redwing songs, even for whole Iceland. This Redwings stay in a small area, from the west side of the river Morsá to Bæjarstaðarskógur. Their song start with three or two falling pitch tone, always the same, before they start to sing in full blast. If you are trained listener you will hear this Redwing song in this recording. This is a highly amplified recording. Recorded with MKH20 & NT1a, very close to each other at 52dB and then amplified again +30dB, so the sound is rather „flat“. Quality open headphones are though recommended while listening at low level. An outwash plain, also called a sandur is a plain formed of glacial sediments deposited by meltwater outwash at the terminus of a glacier. As it flows, the glacier grinds the underlying rock surface and carries the debris along. The meltwater at the snout of the glacier deposits its load of sediment over the outwash plain, with larger boulders being deposited near the terminal morraine, and smaller particles travelling further before being deposited. Sandurs are common in Iceland where geothermal activity accelerates the melting of ice flows and the deposition of sediment by meltwater. The original sandur from which the general name is derived is Skeiðarársandur, a broad sandy wasteland along Iceland’s south-eastern coast, between the Vatnajökull icecap and the sea. Skeiðarársandur is the largest sandur in the world, covering an area of 1,300 km2 (500 sq mi). Volcanic eruptions under the icecap have given rise to many large glacial bursts (jökulhlaups in Icelandic), most recently in 1996, when the Ring Road was washed away (minor floods have also occurred since then). This road, which encircles Iceland and was completed in 1974, has since been repaired. 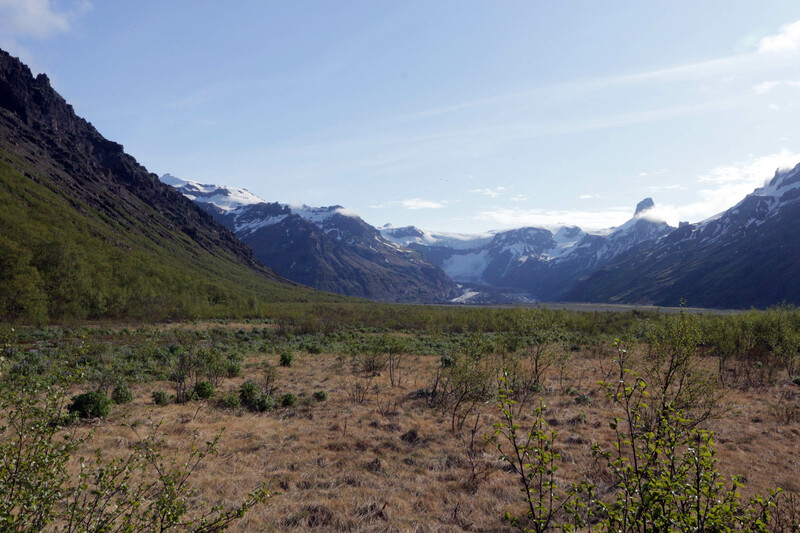 The 1996 jökulhlaup was caused by the eruption of the Grímsvötn volcano, with peak flow estimated to be 50,000 m3/s (1,800,000 cu ft/s) compared to the normal summer peak flow of 200 to 400 m3/s (7,100–14,100 cu ft/s). Net deposition of sediment was estimated to be 12,800,000 m3 (450,000,000 cu ft). This recording is just 23 minutes of 1o hours long overnight recording. It is very quiet and highly amplified. 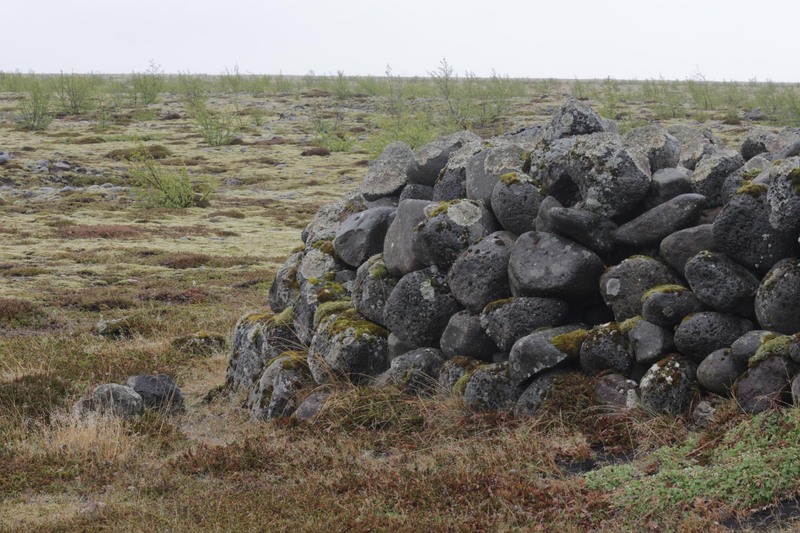 The microphones are unexpected located near to Northern Wheatear´s nest which is between stones in old ruins in the middle of Skeiðarársandur. You can hear wing flaps and some kind of a conversation between the birds and the youngsters. The birds sounds a little bit out of phase but that could be either because the bird is mostly behind the microphones, or the stone wall, or because the fury windshield was still soaking wet after heavy rain one hour earlier. At 1:35 min a thunderous boom sounds from glacier in distance. During the recording the weather changed from calm to be windy. Hér er á ferðinni rúmlega 20 mínútna löng upptaka sem er partur af 10 klst langri næturupptöku frá því 29. maí 2016 á Skeiðarársandi. Á sandinum svo til miðjum er hlaðin rúst sem líklega hefur gengt því hlutverki að vera fjárrétt áður en árnar á sandinum voru brúaðar. Í upptökunni má heyra að í vegghleðsluni er hreiður Steindepils. Hann pirrar sig eitthvað á óboðnum gesti þessa nótt, hljóðnemunum, en virðist svo líka eiga einhver samskipti við unga sína með lágværu tísti eða muldri. Heyra má að á þessum rúmu 20 mínútum að veðrið breytist frá því að vera logn yfir í rok. Mælt er með því að hlusta á upptökuna í góðum opnum heyrnartólum og á miðlungs- lágum hljóðstyrk. 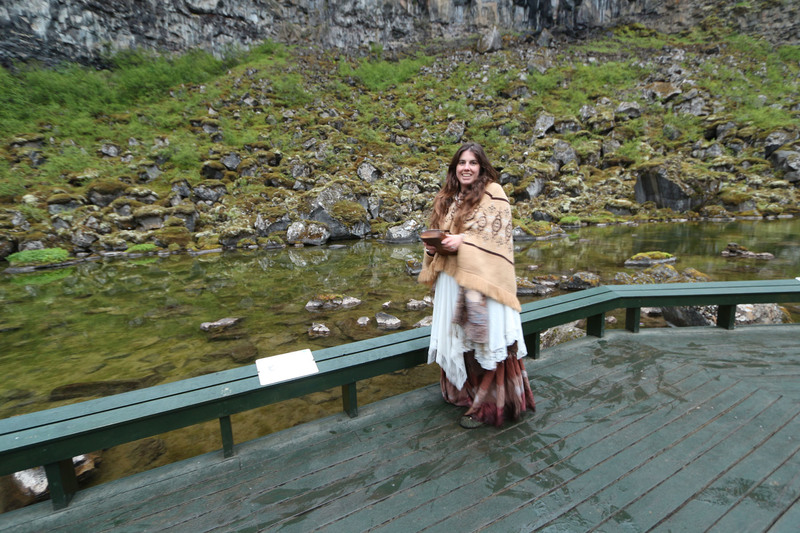 The 10th of July 2015 I visited Ásbyrgi national park, in the north east Iceland. I arrived around 9 pm. The weather was rather cold, with light drizzle rain. However there was a sport game on the old camp side held by the local community. Calls, yell and sheers from audience sounded fantastic in the echo from the surrounding cliffs. Mixed with the birdsong from the forest and the cliffs above it sounded like I was in another world. I found a good place to record this amazing soundscape. Soon I noticed a boring noise in the background from petrol power generator so the recording was shorter than I hoped . When I came back to the car park the sport game was finished and the people were leaving the place. I heard someone in the crowd playing on Mbira thump piano. It came from female in traditional dress. Her instrument sounded nice in this place, so I enjoyed listening while I was packing my gear in the car. „I am from everywhere“ she repleted. Funny answer, I thought and started to listen to the conversations. Why not record her while she was playing? She gave me a permission, so we took a walk to Botnstjörn pound in the bottom of Ásbyrgi. Her name is Jessica Rose, with nickname Fairy. I did not dare to ask her about her nationality, but her English was from the west, maybe from Canada, or north east USA. She was traveling in Iceland with her sister and two friends. Um miðjan júlí 2015 kom ég við í Ásbyrgi. Ég hafði gefið mér nægan tíma þar árið áður svo ég ætlaði ekki að að eyða þar miklum tíma heldur fara á aðra staði í þjóðgarðinum sem ég hafði „hljóðstað“ á.
Ég kom á bílastæðið í botni Ásbyrgis um kl. 21. Á gamla tjaldsvæðinu stóð yfir íþróttamót. Það var því óvenju mikið af bílum og fólki á svæðinu. Hvattningarköll áhorfenda bergmáluðu sérkennilega milli klettanna í bland við fuglasöng úr skóginum og fýlahjal ofan úr klettunum. Ég rauk því til og fann mér upptökkustað. En það leið ekki á löngu að suð frá bensínrafstöð á keppnissvæðinu fór að pirra mig. Upptakan var því styttri en til stóð. Þegar á bílastæðið var komið var fólk að streyma af mótssvæðinu. Heyri ég þá að einhver spilar á þumalpiano sem hljómaði skemmtilega á þessum stað. Var þar á ferð dama að nafni Jessica Rose sem vildi láta kalla sig Fairy. Var hún þarna í félagsskap með systur sinni og tveimur öðrum vinum á ferð um landið. Ég stóst ekki mátið. Ég fékk leyfi hjá henni til að taka tónlist hennar upp og var það gert á pallinum við Botnstjörn.